For the last five years, the French people have been hearing about distant wars, but without ever understanding what they meant. The Press informed them about the engagement of their army in Libya, but never about the presence of French soldiers on mission in the Levant. My articles on this subject are widely-read, but perceived as some sort of Oriental aberration. Despite my personal history, it remains quite acceptable to qualify me as an « extremist », or a « conspiracy theorist », and to point out that my articles are reproduced by Internet sites of all political colours, including those which are in fact authentically extremist or conspiracist. Yet nobody seems to have any quarrel with what I write. But neither do they pay any attention to my warnings about the alliances concluded by the French governement. Now, suddenly, the unheeded truth surfaces. France was attacked on the night of Friday 13th November 2015 by several commandos who massacred at least 130 people in five different areas of Paris. The state of emergency was decreed for a period of 12 days over the whole territory, and may be extended by act of Parliament. The French Press interprets these acts of war by linking them to the attack made on Charlie Hebdo, although the operational modes were completely different. In January, the attack was aimed at killing specific people, while in this case, it was a co-ordinated attack on a large number of people chosen at random. We know today that just before the January attack, the editor-in-chief of Charlie Hebdo had received a « gift » of 200,000 Euros from the Near East in order to continue his anti-Muslim campaign  ; that the killers were linked to the French intelligence services  ; and that the origin of their weapons is covered by the Official Secrets Act . I have already demonstrated that the attack was not an Islamist operation , that it was immediately recuperated by a state , and that this recuperation had raised echoes in populations hostile to the Republic  – an idea which was brilliantly developed a few months later by the demographer Emmanuel Todd . 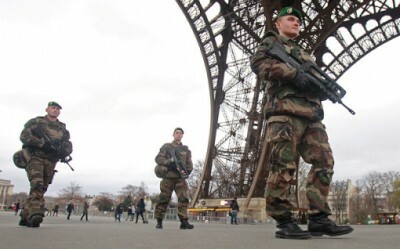 To get back to the war which has just spread to Paris, it has been a shock for Western Europe. It can not be compared to the attacks in Madrid in 2004. In Spain, there were no shooters, no kamikazes, but 10 bombs placed in 4 separate locations . The type of horror which has just exploded in France is the daily lot of many populations of the « Wider Middle East », and has been since 2001. And comparable events can be found elsewhere, like the three days of attacks in six distinct locations, in Bombay, 2008 . Even if the assaillants of the 13th November were Muslims, and even if some of them shouted « Allah Akbar ! » as they killed passers-by, there is no link to such earlier attacks, to Islam, or to an eventual « war of civilisations ». These commandos had clearly received the order to kill at random, without first enquiring as to the religion of their victims. In the same way, it is absurd to take at face value the motive claimed by Daesh against France – even if there is no doubt about its implication in this attack. Indeed, if the terrorist organisation had wanted to « avenge » itself, it would have struck at Moscow. The interpretation of these events is unclear, because behind non-state groups there are always states which sponsor them. In the 1970’s, the Venezualan Ilich Ramírez Sánchez, known as « Carlos » or « The Jackal » aligned himself by conviction with the Palestinian cause and the Revolution, and was offered the discrete support of the USSR. In the 1980’s, the example of Carlos was revived by mercenaries working for the highest bidder, like Sabri al Banna, known as « Abou Nidal », who carried out terrorist attacks for Libya and Syria as well as Israël. Today, there exists a cloudy network of terrorism and secret actors implicating a large number of states. In principle, states always deny their participation in terrorist groups. However, the French Foreign Minister, Laurent Fabius, declared in December 2012, during the « Friends of Syria » conference in Marrakesh, that Al-Nusra, the Syrian branch of Al-Qaïda, had « done a good job » . Because of his status, M. Fabius knew that he did not risk being taken to court to answer for supporting an organisation listed as « terrorist » by United Nations Security Council, but he took a serious risk for his country by dropping them into the cauldron of terrorism with this statement. In truth, France had been implicated on the side of Al-Qaïda at least since the beginning of 2011. At that time, the United Kingdom and France had signed up for the US project called « the Arab Spring ». The goal of this operation was to overthrow all the secular Arab régimes and replace them with dictatorships run by the Muslim Brotherhood. Although London and Paris had discovered this operation while it was on-going in Tunisia and in Egypt, they had previously been solicited for Libya and Syria . In Libya, with the help of the Italian Special Forces, they organised the massacres in Benghazi, and then, with the help of Al-Qaïda, the capture of the Libyan arsenals. I can attest to the fact that in August 2011, while I was under the protection of Khamis el-Kadhafi, NATO assaulted the capital, and the Hotel Rixos, where we were staying, was seiged to cries of « Allah Akbar ! » by a unit of Al-Qaïda. They were called the Tripoli Brigade, and were commanded by Mahdi al-Harati and supervised by operational French officers. The same Mahdi al-Harati was present with his commanding officer, Abdelhakim Belhaj, the founder of the so-called « Free Syrian Army » which was in reality a section of Al-Qaïda, fighting under the French colonial flag. In Syria, the presence of French officers supervising armed groups while they were committing crimes against humanity is widely attested. France then went on to play an extremely complex and dangerous game. In January 2013 – in other words, one month after Laurent Fabius’ public support for Al-Qaïda in Syria – France launched an operation in Mali against the same Al-Qaïda, provoking the first reaction against its agents infiltrated in Syria. You, of course, have never heard anything about all that, because although France has democratic institutions, its current policy in the Arab world has never been publicly discussed. In violation of article 35 of the Constitution, it decided to enter into war with Libya and Syria after only a few hours of superficial parliamentary debate – at the most – and without a vote. The French parliamentarians thus discarded their mandate to excercise control over the Executive as far as foreign policy was concerned, apparently believing that this was a private domain of the President, and without real consequence for daily life. However, as anyone can now see, on the contrary, peace and security, one of the four « Human and Citizens’ Rights » of 1789 (article 2), depend upon it directly. The worst is yet to come. In the beginning of 2014, while the liberal US hawks were working on their plan for the transformation of the Islamic Emirate in Iraq and Cham into what was going to become Daesh, France and Turkey transported munitions to Al-Qaïda so that they could fight the Islamic Emirate – this point is attested by a document presented to the Security Council on the 14th July 2014 . However, France later joined this secret operation, and participated in the international anti-Daesh Coalition, which, as everyone now knows, contrary to its name, did not bomb Daesh, but delivered weapons to it for a year . The situation evolved further after the signature of the 5+1 agreement with Iran. The United States suddenly turned on the terrorist organisation and pushed it back to Al-Hasakah (Syria) . 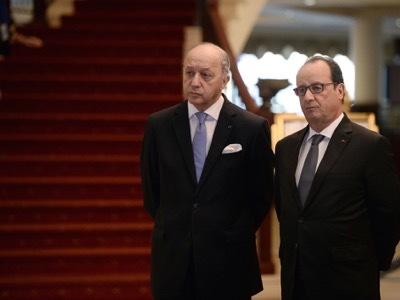 But it was only in mid-October 2015 – a month ago – that France began to fight Daesh. Not to stop the massacres, but to conquer part of the territory it occupies in Syria and Iraq, and install a new colonial state which is to be called « Kurdistan », even though the Kurdish population will be largely in the minority . In this perspective, France sent its aircraft-carrier – which has not yet arrived – to support the Marxist-Leninists of the Kurdish party YPG against its ex-ally Daesh. But what does this polititcal reference mean when the project is to create a colonial state ?. We are currently witnessing the second reaction. Not from al-Qaïda in Syria this time, but from Daesh in France, on the instructions od France’s unmentionable allies. Daesh is an artificial creation. It is nothing more than the instrument of the policies of several states and multinationals. Its principal financial resources come from petrol, Afghan drugs – of which the French have not yet understood the implications on their own territory – and Levantine antiques. Everyone agrees that the stolen petrol freely crosses Turkey before being sold in Western Europe. Given the quantities involved, there can be no possible doubt about Turkish support for Daesh . Three weeks ago, a spokesperson for the Syrian Arab Army revealed that three planes, respectively chartered by Turkey, Saudi Arabia and the United Arab Emirates, had exfiltrated Daesh combatants from Syria and taken them to Yemen. Once again, there can be no possible doubt concerning the links between these three states and Daesh, in violation of the pertinent resolutions of the UN Security Council. Following the first Geneva Conference in June 2012, I explained in depth that a faction within the US state apparatus was waging its own policy, contrary to that of the White House. At first, this conspiracy was directed by the head of the CIA, which was the co-founder of Daesh in 2007 (« The Surge ») , General David Petraeus, until his removal in handcuffs the day after the re-election of President Barack Obama. Then it was the turn of Secretary of State Hillary Clinton, who was prevented by an unfortunate « accident » from completing her mandate during the period of presidential transition. Finally, the combat was continued by ambassador Jeffrey Feltman from his offices at the UNO, and by General John Allen, at the head of the phoney anti-Daesh Coalition. This group, a part of the US « deep state », which had never ceased from opposing the 5+1 agreement with Iran and fighting the Syrian Arab Republic, maintains its members within the Obama administration. Above all, it can count on the multinational corporations, whose budgets are greater than those of the states themselves, and who can finance their own secret operations. In particular, this is the case of the petrol company Exxon-Mobil (the true owner of Qatar), the investment fund KKR, and the private army Academi (ex-Blackwater). France has thus become a mercenary state working for these multinationals. On the 11th November 2015, French Prime Minister Manuel Valls declared that France was engaged against terrorism . On the 12th November, the Observatoire national de la délinquance et des réponses pénales (National Observatory for Delinquency and Legal Response) – attached to the Ministry of the Interior – published a report stating that terrorism has become the second preoccupation of the French people, after unemployment . On the morning of the 13th November, in Nanterre, the Minister for the Interior, Bernard Cazeneuve, presented a 20-part plan to limit the arms traffic . Clearly, the government was expecting the worst, which implies that France was in negotiation with the organisation that attacked it. France made engagements that it did not respect, and is now certainly the victim of blackmail by the terrorist leaders it has betrayed. An excercise simulating terrorist attacks was carried out on the very morning of the attack by the hospital emergency services . A coïncidence that had already been revealed during the attacks of the 11th September 2001 in New York and Washington, those of the 11th March 2004 in Madrid, and also the 7th July 2005 in London. The successive French governments have created alliances with states whose values are opposed to those of the Republic. They have successively engaged in secret wars on their behalf, and then retreated. President Hollande, his private Chief of Staff, General Benoit Puga, his Minister for Foreign Affairs, Laurent Fabius, and Fabius’ predecessor Alain Juppé, are today the objects of blackmail from which they can not extricate themselves without revealing the mess in which they have implicated their country, even if this exposes them to the High Court of Justice. On the 28th September, at the tribune of the United Nations, President Putin, addressing the United States and France, exclaimed: « I would like to ask those responsible for this situation – “Are you at least aware of what you have done ?” But I fear that this question will remain unanswered, because these people have not renounced their politicies, which are based on an exaggerated self-confidence and the conviction of their exceptional nature and their impunity » . Neither the United States nor France listened to him. It is now too late. The French government has progressively distanced itself from international legality. It has perpetrated political assassinations and supported terrorist actions since at least 2011. The French government has created unnatural alliances with the wealth oil dictatorships of the Persian Gulf. It is working with a group of US personalities and multinational companies to sabotage the politics of appeasement advanced by Presidents Obama and Putin. The French government has entered into conflict with some untrustworthy allies. One of these organisations sponsored the attacks in Paris.